The Club's Safeguarding and GDPR policies can now be downloaded. 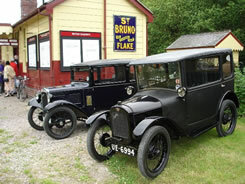 Welcome to the official website of the Pre-War Austin Seven Club (PWA7C), the largest international club for Austin Seven enthusiasts everywhere. Founded in Derby, England in 1962, the Club has grown to over 1000 plus members in 17 countries around the World, making it the world's largest International Club catering solely for Austin Sevens of all types. The Club produces a quality monthly magazine packed with interesting articles along with technical features, hints, tips and advice on how to keep these endearing vehicles running at their best. The monthly club magazine delivered to your doorstep – packed with regular columns about most models, a lively letters section and details of cars and parts looking for their next home! Technical advice including information about spares – club experts can save you time, money and worry. Regional get-togethers and social events. Car insurance schemes, valuation and authentication services. A wide variety of literature to assist owners (see Bookshop). The monthly publication is supplemented each quarter by The Austin Seven Clubs Association magazine at no extra cost. The Club registrar has access to archive records to accurately date your car and other officers provide assistance with problems relating to registration, insurance valuation and licensing. The valuations are acceptable to the A7CA Insurance plan brokers whose scheme offers very reasonable rates together with comprehensive cover including a vehicle salvage clause. 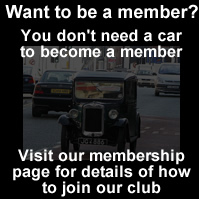 The Club has always promoted a policy of car usage in whatever guise, and throughout the year provides opportunities for members to participate in static rallies, road runs, sporting trials, speed events, reliability runs plus a host of other items too numerous to mention. Some of these reflect the contribution of the various groups which are encouraged to flourish throughout the UK and provide regional bases for members to attend meetings weekly or monthly.